Lynn Harding was born on 10th of August, 1961 but only took up running in 1984. Rhona McLeod interviewed her for “Scotland’s Runner” magazine five years later, after her very best performance in the London Marathon on the 23rd of April 1989. Veronique Marot won in a UK record of 2.25.56 (which lasted until 2002) and, in a top international field, Lynn finished eighth (third Briton) in an excellent 2.31.45 – a Scottish Record. Rhona’s article follows. Rhona Mcleod interviews Lynn Harding, the little known marathon runner from Milngavie who set a Scottish national record of 2:31:45 when finishing eighth in the London Marathon, and who became the first Scot to achieve a qualifying time for New Zealand. Having only taken up running five years ago, Lynn Harding stole a march on much more experienced Scottish athletes by racing well within the Commonwealth Gaes qualifying time of 2:35 at the recent London Marathon. The race was only the second marathon of her life making her eighth place time of 2:31:45 even more remarkable. Unlike most of our top athletes, Lynn’s career did not start as a young girl. It began five years ago when as a 22 year old she decided to join a Harriers club to get some company in her newly adopted town of Sunderland. It was at this point that she decided to take up running in order to occupy herself while she had nothing to do. “I’d always enjoyed walking, so by running I could see even more of the countryside. The other advantage of running was that it was cheap.” Almost a year after graduating Lynn was offered a job. However she had to leave home to move to England and an accountancy post with the Sunderland and South Shields Water Company. 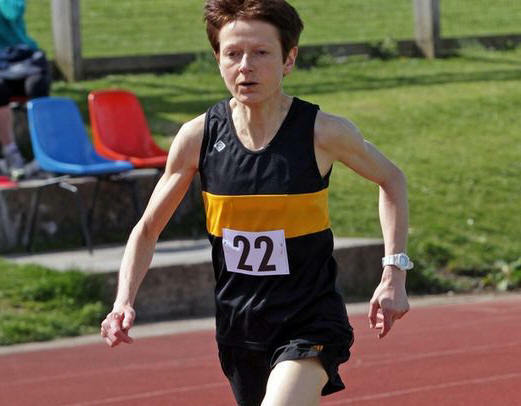 Since then Lynn has been living and working in England and running for her local club, Houghton Harriers. Her training began modestly – around four miles, three times a week, and then after about a year and a half she increased this to 25 miles a week. “At the time I thought it was a massive mileage,” she laughs, “but I achieved my big target of being able to go out running with the men and keeping up with them.” As time passed, Lynn gradually increased her training and ran a few races ranging from 3000m to half marathons, then two years ago she realised that the 1990 Commonwealth Games were in Auckland, New Zealand. It was at this point that she made a committed decision to gain a marathon place in the Scottish team. She trained hard and last September she had her first experience over the distance – the NALGO North Tyneside Marathon. She finished with a time of 2:47:59, with the realisation that to gain Commonwealth selection, she would probably have to lose around 13 minutes from her time. Sitting in their respective homes, Paul Bentley and Lynn’s family were despairing. After the first couple of women had finished the race, the television coverage left the finish line to look at the field still out on the course. The minutes were creeping towards and then past the magic 2:35:00 and still no sign of Lynn. Just as anxiety was at fever pitch the results of the top group of women were flashed on the screen. “8th: Lynn Harding: 2:31:45”. Although until now Lynn has been a little known name in Scotland, it is not because she has deliberately decided to Anglicize herself. She is fiercely proud of being a Scot and would like nothing more than to be an integral part of the Scottish athletics scene. Assuming Lynn is in the team for Auckland – and the selectors have said that all athletes who achieve the ‘A’ guideline will go – it’ll be almost a Cinderella type story – but this time the unknown at the ball will be there thanks to the magic of her own self-belief and commitment to her dream. Wednesday: pm steady 12 – 15 miles road run. Average weekly mileage: 80 miles. Later in 1989 Lynn improved her track times. She ran 3000m in 9.39.0 and won a gold medal when winning the Scottish 10,000m in a Championship Best Performance of 34.00.4. After a very fast PB half marathon in 73.09, she was selected to run for GB at the World 15k Road Race at Rio de Janeiro in September, finishing 36th in 54.30. The team was fourth. Lynn raced mainly in the Newcastle area but often travelled to Scotland, usually for half marathons. On the seventh of August 1988 she set a record of 74.58 (which still stands in 2010) for the Moray Half Marathon, not that far behind the men’s winner Colin Youngson (69.18). As late as June 1994 she won the Dumfries Half Marathon. In 1990 she came close to her 10km best in 33.32 as well as running a half marathon in 73.57 for fifth in the Great North Run. She won half marathons at Nairn and Cleveland, before finishing eleventh (2.47.24) for Scotland in the Auckland Commonwealth Games Marathon. The marathon was not tackled by Lynn in 1991. She won 10 mile road race in North Shields in March and a 10k in Forres in May. However in 1992 she enjoyed a much better season, starting with a victory in March at the Redcar Half Marathon (76.01). Then on 30th May she ran for GB in the Stockholm Marathon, finishing a good third (2.43.26). In August she won at Nairn (77.16) and was fourth in the Great Scottish Run half marathon in Glasgow (75.43). This was her build-up for the Berlin Marathon on 27th September 1992, when she was tenth in an impressive 2.38.01. In 1993 her Autumn season followed a similar pattern, with 4th in the Great Scottish Run (75.43); a win at Hexham over ten miles (56.41); and on 10th October a win over twenty miles at South Shields (1.57.58). Then on 31st October she was tenth in the San Sebastian Marathon in an excellent 2.35.04. 1994 was Commonwealth Games year and Lynn Harding tried to build up once again. In March she won a ten mile race (56.06) at Tynemouth and a twenty mile race (1.59.45) in Hull. In July she won the Helensburgh Half Marathon in 75.28. Then on the 27th of August she represented Scotland in the Commonwealth Games Marathon in Victoria, Canada. The field was small but very competitive. Lynn hung on as long as possible before fighting to the finish in 12th place (2.40.57, ten minutes behind the Canadian winner. Lynn’s time was second on that season’s Scottish ranking list to the outstanding W35 Karen Macleod, who was fourth (2.33.16) in Victoria. Lynn made a very successful foray into ultra distance running in May 1995 when she was second in the European 100km Championships in France. In her debut at this distance, she finished in the excellent time of 7 hours 52 minutes 23 seconds, and also led the Great Britain Ladies to Second Team behind the host nation and ahead of Germany. Two European silver medals in one race! Fellow Scot Donald Ritchie became European Over 50 champ in the same race, recording 7:16:17 while representing Great Britain for the eighth time. Although road was her favourite surface, Lynn Harding had always been a good cross-country runner, winning an individual silver medal in the 1988 Scottish Championship after a real battle with Sandra Branney; and following that with a bronze medal in 1989. On the 9th of November 1996, she ran brilliantly for Scotland to win the W35 race in the British Home Countries International CC at Beach Park, Irvine, defeating athletes from Eire, Northern Ireland, England, Wales and of course Scotland. Lynn was a quiet, modest, friendly International Athlete who ran in a stylish controlled way, to produce some excellent performances, especially over the marathon and her favourite half marathon distance.